Two Amver ships rescued 46 crew members from a sinking fishing boat approximately 690 miles west of Dutch Harbor, Alaska on Tuesday, July 26, 2016. U.S. Coast Guard 17th District rescue personnel received an electronic position indicating radio beacon (EPIRB) alert from the fishing vessel Alaska Juris on Tuesday and confirmed the crew was preparing to abandon ship. Coast Guard rescue authorities sent a C-130 aircraft, diverted the Coast Guard Cutter Midgett and used the Amver system to alert several participating commercial ships in the area of the distress. The German-flagged container ship VIENNA EXPRESS and Norwegian-flagged bulk carrier SPAR CANIS agreed to divert and assist the stricken fishing boat. 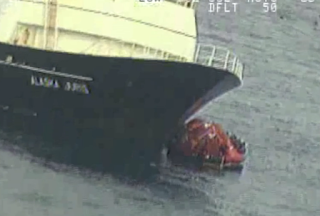 Both Amver ships arrived on scene and successfully rescued all 46 crew members. There were no reports of injuries and the survivors are being taken to Adak, Alaska where they will be met by medical personnel. A salvage operation has been initiated for the fishing boat. The VIENNA EXPRESS, managed by Hapag-Lloyd AG, enrolled in Amver on March 7, 2010 and has earned six Amver participation awards while the SPAR CANIS, managed by Spar Shipping, enrolled on March 29, 2006 and has earned four Amver participation awards. Video of the rescue is available here.